Laminitis can b e triggered by a variety of factors, but research has shown that 80% of cases are caused by feeding equines too much soluble carbohydrate, such as the starch and fructans found in grass. Excessive feeding of cereal based concentrates can lead to a case of laminitis, but it is also important to be aware that autumn grass can be particularly lush and high in sugar. Some horse owners fall into the trap of believing that grass has finished growing as the summer months draw to a close, but this is not the case and in actual fact, an autumnal environment can provide the perfect conditions for rapid growth! Why is laminitis a risk in the autumn? The hot, dry summer months result in us battling with parched, baked-hard land and decreased levels of rainfall stifles grass growth, however microbial activity within the soil is on-going although there is little apparent change in our grazing. Additionally, soil remains warm from the summer months and when the autumnal rain finally does arrive, it presents the perfect conditions for late, rapid growth. This autumn growth can lead to an excess of lush, leafy grass that is exceptionally high in nutrient value and calories. Most equines are likely to head straight for this succulent, sugar rich alternative to dry forage, greatly increasing their risk of laminitis, but this can be avoided! What can we do to avoid autumn laminitis? As horse owners, care must be taken with rich, autumn grazing, particularly for horses and ponies prone to weight gain and laminitis. We are aware that it is the soluble carbohydrate, such as the starch and fructans found in grass that can cause a problem, but it is also important to realise that it is the total weight of these carbohydrates consumed that can put a horse at risk of laminitis. So it is advisable to divide large paddocks into smaller sections in order to limit grass intake and set up well-grazed ‘weight watchers’ fields for those likely to succumb to weight gain. Also remember to feed according to your horse’s build, breed and workload to avoid surplus calories. If you do choose to turn your horse out through the autumn months it is important to keep a record of their weight and also to be able to recognise a good, healthy weight for your individual horse. Buy a weigh tape and take note of your horse’s weight at several intervals throughout the year. You should be able to feel your horse’s ribs through their skin and there should be no other areas of visible fat such as an excessive crest. 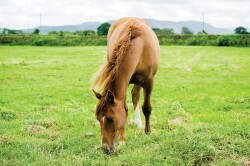 If your horse does begin to gain weight move them into a smaller or less lush paddock and reduce their grazing hours. Buying a grazing muzzle with slots cut into the bottom will allow your horse to continue to roam freely without access to too much lush grass. If your horse or pony continues to gain weight it may be time to consider keeping them stabled for longer to further reduce their hours of grazing. It is best to feed little and often and aim for a high-fibre diet, so supplement grass with good quality forage, such as hay.